> Not only is the beginning of another year here, but a whole new decade is now upon us. This is the time to reflect on things done and gone right and wrong and the time to forgive others and yourself for things that may not have gone in a positive direction. It is what it is, and dwelling will only keep you in a negative state where you lose all of your power and even yourself if you let it get to you and really, no one who would cause the hurt deserves that kind of power. Remember that good or bad, EVERYTHING is a learning opportunity that can help you strive forward in the present, and future. I am truly not a fan of “resolutions” as it really should be a year-round, lifelong thing but am a big advocate of goal setting and the new year is often a reminder of this to many. If starting a new years resolution is what you need to start your goal setting, so be it and welcome that. The key thing to remember is to properly set your goals and to change them as you achieve them and/ or progress. One of the biggest reasons people fail at their goals is because their goals are either not their own (really look inside yourself and why you want to achieve whatever it is your going for) and they set the bar too high without breaking it into smaller attainable levels that will ultimately lead to the big goal. Whatever you decide you want to change, remember that it is absolutely possible if YOU want it. You may seek out all the help and advice and pills, gizmos etc. but others can only offer you advice or guidance, you have to be the one to WANT to change and genuinely if you want it, the power is completely in your hands. You have the power to choose happiness, fat loss, quitting smoking, gambling, or whatever else it is. When you are really ready, it just clicks and you will be on your way. Sure it is always good to rationally think about things you are about to embark upon, but remember that thinking and talking about it does nothing, it is action upon those thoughts that make you excel. Maybe one of your goals or resolutions should be to lose fears, you would be surprised how many people let these hold them back in life. Take some time for yourself, by yourself and clear your mind. Focus on what it is that you want in your heart, even if you think it is totally out there. Write those thoughts down and you have made your first step at achieving them. Now take those and break them down into yearly, monthly, weekly, daily or even hourly goals or steps that will get you on the path to your ultimate goal. Now write down for each mini goal resources that can help you, it is kind of like what you learned in grade school about writing with the “brainstorming bubble”. This is a proven and very effective way to not only help you with setting the goals, but in achieving them. 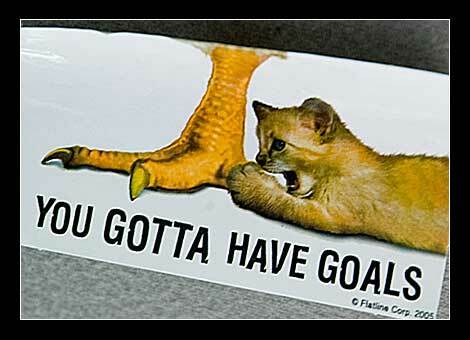 Make your goals public if you need to and be sure to post them or have them handy to look at EVERY SINGLE DAY. It may seem too hard, or like it will take too long or (insert excuse here), but any and everything in life worth having takes hard work, dedication, and persistence. Don’t ever give up! >This is a great note! Thanks for sharing!Keep'em coming.G.